Adding a dog to your household can bring you companionship, love, and loyalty. It can also lead to some challenges. Fortunately, with some preparation, discussion, and determination, you can help your new pet adjust to life with your family and make the transition go smoothly. Here are some tips for you and your family. Before you bring your dog home for the first time, make sure you have all of the supplies you will need. This includes food, food and water bowls, a collar, a leash, and toys. Get an identification tag with your dog’s name and your phone number as soon as possible. Get a crate for your dog. This can make housetraining and obedience training easier. Dogs have a den instinct and like to have their own space, as long as they are not kept in a crate all day and night. Make sure the crate does not have any wires where the dog’s collar or paws can get caught and it is large enough for the dog to move around freely. If you cannot get a crate for your dog, you can put up a baby gate to keep the dog in a safe area. You will need to set some ground rules for behavior that is and is not allowed. It is important to figure out the rules in advance and make sure all of your family members are on board and will enforce them. This includes who is responsible for feeding and walking the dog and when, what parts of the house your dog is and is not allowed in, whether or not it is allowed on furniture, and where it will sleep. If you have other pets, make sure they are in good health and up to date on all of their shots before you bring a new dog home. Sometimes dogs have viruses that the new owners are not aware of until another pet gets sick. Your dog will be nervous when you bring it home for the first time. You can alleviate some of your dog’s anxiety by arranging the arrival for a day when you will be able to spend some time playing with it. If you have other pets, you can introduce them to each other, but don’t expect them to become best friends right away. Be sure to give your other pets the same amount of attention you normally do so they won’t be jealous of the new dog. You should take your new dog to the veterinarian for a checkup within a week after you adopt it so it can get any necessary vaccinations. If your dog has not been spayed or neutered, you should schedule the surgery. If your dog is not housetrained, you will need to work on that over time. Read articles or books about housetraining a dog. Create a routine for your dog so it will know when it can expect to be walked. Come home from work as quickly as possible so you can walk the dog to prevent accidents. If your dog does something it shouldn’t, scold it in a firm voice while staying calm. Praise your dog when it behaves well. Sign up for an obedience class. Dogs need to stay physically active. Take your dog on frequent walks, throw a ball or stick, or play Frisbee. A dog that gets plenty of exercise is more likely to be well-behaved at home. If you want to let your dog play in the yard, you need to make sure it won’t run off. If your yard is not fenced in, you can install a DogWatch® hidden fence that will emit a radio signal and a mild stimulation if your dog gets too close. 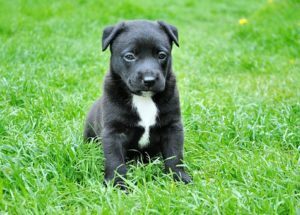 Your dog will quickly learn to stay in the yard so it can enjoy playing outside and you can have peace of mind knowing it will be safe. Contact DogWatch of Western Massachusetts today to learn more.